Yesterday I shared recipes for hummus and flaxseed tahini. 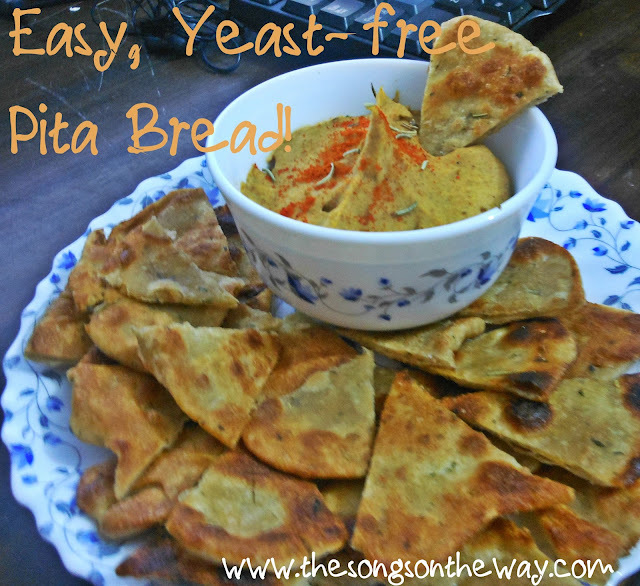 Today I'm sharing this awesome unleavened pita bread recipe! I love eating hummus with pita bread, but normally pita bread is made using yeast... and I didn't have any. I googled "unleavened pita-like bread"... only to be startled to find people discussing the fact that pita comes in both leavened and unleavened varieties! Examining a recipe, I realized it's very similar to Indian breads, which I make all the time. However, pita bread tastes so different.. I wasn't sure if it would be good. But it is! These pitas, due to be unleavened, do not have pockets so are not meant to be stuffed. They are suitable for wraps or to make pita chips, however! A friend of mine suggested I add herbs, which made perfect sense and I did happily. They are optional. All right, to the recipe! Estimated preparation time: 45 minutes, including letting dough sit. Makes 12 pitas. Put flour and salt in a bowl, mix together. You can add the herbs now, or later. hand the Indian way. The right consistency is smooth, but not sticky. If it's too sticky, add more flour, if it's too sticky add more water.... if it's almost there, but not quite like mine was, do what I did and add a few teaspoons of olive oil. It makes the dough a great texture. If you would like to add herbs, add them now if you haven't, or if you did but would like to add more. I have found when I add herbs to flat breads I always underestimate. Roll them into balls according to how large you want your pitas. I made my balls around golf ball size, and they made small pitas. Set in a bowl and cover with a wet towel. Leave for 10-12 minutes. my hand stretching alone attempt! I found the perfect combination was both rolling and hand stretching. I tried both flattening it with my hand into a circle, then rolling it out more and rolling it out until it was in-between a quarter of an inch and an eighth of an inch thick and hand stretching it a few inches bigger. Both combination methods worked fine. In order to get the right texture, I would make your dough a little thick, no less than an eighth of an inch. I am using whole wheat flour though. With white flour, it may a little lighter! Once your pitas are rolled out, or maybe even before you finish the last ones, put a little olive oil in a frying pan or on griddle and turn the stove on low. Let it heat for a few minutes before you start cooking. Then place your pita bread gently in the pan. It should sizzle. On low on my stove each side took probably two minutes or more, but I checked more often than that to make sure that it didn't burn. Flip over until both sides appear done, having parts that have turned a nice brown. If your pitas are uneven from hand stretching, check for any patches that seem to still be raw. If you spot any, flip them and use a spatula to press that part against the frying pan for a few seconds. After each pita is done, place to the side on a plate. For serving with hummus, cut into sixths or eighths according to the size of the pita. Thanks for posting this! Reminded me of my college days! Oh! You're my hero! I was craving some bread but I didn't have any (because I'm trying to eat less), and didn't want to make anything too complicated. This was perfect. Super tasty! I used fresh thyme and dill, apart from the salt and the olive oil.